2016 Leaf Signature Series Wrestling looks to the ring with an autograph-filled release. Featuring retired greats and more modern names, each box promises eight autographs. 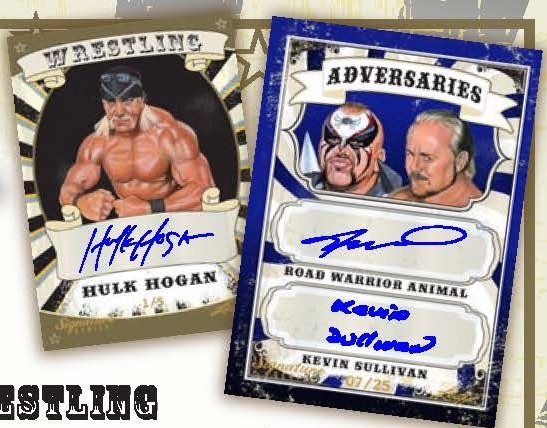 Issued in several designs with artwork images and a sticker signature, options include single-signed Wrestling and Hall of Fame designs as well as Team Effort and Adversaries inserts that feature dual signatures. 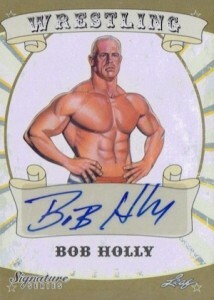 Tentative signers include Hulk Hogan, Goldberg and Kelly Kelly. 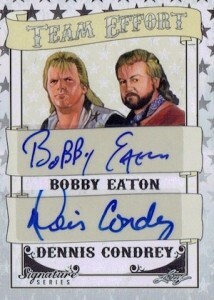 There are also limited Metal Cut Signatures for names like Andre The Giant, Randy Savage and Vince McMahon. The release is limited to less than 250 numbered cases. Check back as more information is provided for 2016 Leaf Signature Series Wrestling. 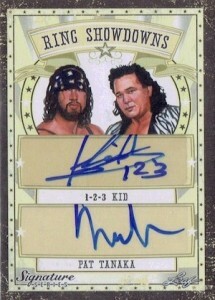 X-PAC 2016 LEAF WRESTLING SIGNATURE SERIES AUTO AUTOGRAPH CARD #20 25! PARALLEL CARDS: Blue #/50 or less, Green #/25 or less, Red #/10 or less, Black #/5 or less, Purple 1/1, Printing Plates 1/1. View specific parallel prints runs with the full spreadsheet. PARALLEL CARDS: Blue #/25 or less, Green #/10, Red #/5, Black #/3, Purple 1/1, Printing Plates 1/1. 76 cards. Serial numbered 1/1. PARALLEL CARDS: Blue #/25 or less, Green #/10 or less, Red #/5 or less, Black #/3 or less, Purple 1/1, Printing Plates 1/1. No big papa pump, this freak is out!